I had it in my head that I was going to make an egg casserole with quinoa and kale, but after a long search on Pinterest, I couldn't find a recipe. So I just took the basics from my favorite strata recipe and created my new favorite. We had it for dinner and then reheated it for breakfast and lunch the next day and can't wait to make it again. We are taking a stab at eating only whole foods, so this fits the bill, tastes great and is easy! bad instagram photo - too good to wait to eat for better photo styling! Preheat oven to 375. Use olive oil to lightly grease the bottom of an 8x8" baking dish. If your breakfast meat is not fully cooked, cook it now. Also, grate your cheese. Trim the tough middle stem from the kale leaves and slice thin. Add to the baking dish with a little cracked pepper and a little more olive oil. 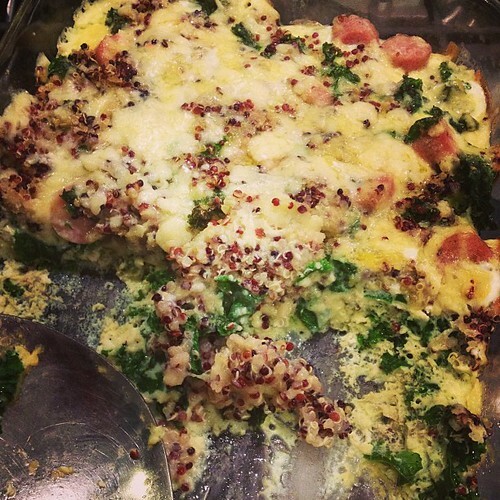 Spread quinoa evenly over the kale and then add breakfast meat and half of the cheese. In a large bowl, whisk together eggs, milk, mustard and hot sauce. Pour over other ingredients in the baking pan. Bake for 20 minutes, sprinkle with remaining cheese and bake 5 more minutes. Let stand a few minutes before serving. Andrew's first reaction was, "you have to start making this for Christmas morning instead of the other (previously mentioned) one!" I'm definitely going to try this! Looks great. Yum , this dish sounds delicious!! Thanks for posting the recipe. Looks yummy! And super high in protein! Yum! That is my kind of food!